BCV4 is a cloning tool for IBM® Db2® systems that automates the duplication, or 'cloning', of entire Db2 systems. It does the steps necessary to copy the original Db2 subsystem, and turns these copies into a new functioning DB2 system - the clone of the original. Fast cloning for table and index spaces, the full DB2 subsystem is now an easy, managable task. For SAP® users, this copy is called a 'Homogeneous System Copy'. BCV4 is innovative. BCV4 was the first to support 'single' and 'shared' environments and is not tied to a single vendor copy service. BCV4 clones complex systems, even combined IMS® / DB2® configurations, in record time. With the BCV4/BCV5 Suite (see link at bottom of this page) cloning subsystems, databases, tablespaces, and tables is fast and easy. Timely availability of information to data warehouses, application servers, etc. Creation of test systems close to the production ones for testing, debugging etc. Creation of a Peoplesoft® or SAP® Clone (DB2 server for SAP), etc. With the BCV5 companion product, we provide the preeminent full and partial clone / copy / refresh solution on the market. Some vendors copy at volume level (Source->Target) whereby the VOLSER may be optionally transferred. If source and target are on the same control unit the the copy will only take seconds. Other vendors make a continuous mirror-copy of the volume and can interrupt the mirroring process within seconds. the DB2 internal catalog still points to the old volume. Duplicate VVDS names, duplicate VTOC index names and hundreds or thousands of duplicate dataset names therefore prevent the immediate use of the target volumes. In addition there are problems with the DB2 internal catalog structure. Especially costly in terms of effort: SAP database servers under DB2. What is required is a consistent renaming procedure for files. BCV4 makes functions available to do this quickly and systematically. After processing through BCV4 the target volumes may be used by standard access methods. BCV4 is "vendor independent" and will work with: TimeFinder®, Snapshot®, FlashCopy®, Peer-to-Peer Remote Copy, ShadowImage®, NanoCopy®, etc. The names used are the trademarks of their respective manufacturers. Of course you could also just use the generally available ADRDSSU utility to create a volume dump. BCV4 is the fast and automated approach for single or scheduled cloning tasks. You may use SAP, Peoplesoft, or run your homegrown DB2 application - with BCV4 you will be able to provide a system clone within minutes. BCV4 can be used in any situation where a DB2 instance has to be copied and where size dictates that only volume copies are feasible, i.e. fast enough. Whether it is the basis of a SAP system or of any other application does not matter. BCV4 generates a batch process that contains between 8 to 50 jobs dependent on the configuration. The entire process of creating a DB2 clone is reduced to just starting a job stream. Using a fast-copy function together with BCV4 can make a ready-to-use clone available within 15 minutes. The figure here shows how the cloned system is available inside 15 minutes based on an environment with about 70,000 datasets and over 300 volumes. 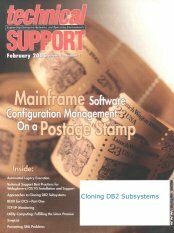 Cloning of DB2 subsystems made easy. If desired, we’ll carry out the first cloning together with you. Dramatically reduce the cloning process time from days to minutes. Need to clone a parts of a DB2 subsystem, or certain databases, tablespaces? Mask data? BCV4 and BCV5, the most complete cloning solution available. All trademarks are of their respective trademark holders including IBM, DB2,z/OS,IMS,VSAM which are of the IBM Corp.